This is the FAQ and informational resource for the Customtacticals Review pages. If there was ever any knife material or mechanism that you wanted to learn a little more about, you can probably find it here. If not, please feel free to contact me and let me know what kind of information I am missing. It is my goal to have a complete resource of knife information available. There simply is not complete resource for general knife material and steel information on the internet without having to search through forum posts, which, while useful, can become tedious if you do not find what you are looking for. The FAQ has been broken down into six main sections which are accessible from the top menu, with a couple of them relating only to folding knives. The six sections are Knife Steels, Blade Geometry, Locking Systems, Opening Systems, Materials, and Other. Most of the section names are self-explanatory but there are a couple that merit some explanation. 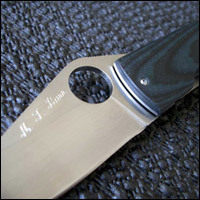 Materials will mostly cover bolster, handle and liner materials such as Mokume, G-10, Micarta and other similar things. Other will cover things like the Emerson Wave or different sheathing systems. Things like the Tek-Lock would fit into this category as well.